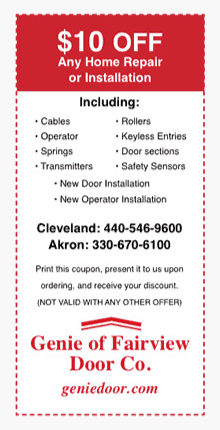 Residential customers, commercial builders, and industrial facility maintenance managers in Cleveland, Akron, Medina and all over Northeast Ohio know us as the “go-to guys” when it comes to garage door operator installation. Our dad, Al Heller started Genie of Fairview Door Company in Fairview Park, Ohio 1964. Over 50 years later, we still install and repair garage door openers (and garage doors!) throughout northeast Ohio. Daily, Genie of Fairview technicians work on homes and businesses on the west, east, and south sides of Cleveland, and throughout Akron. You have likely seen our trucks in your neighborhood and heard our jingle on the radio – “Open up your world with Genie of Fairview; Genie of Fairview doors!”! You are welcome to visit our store and showroom in Broadview Heights. You’ll find the same friendly customer service you’ve come to expect from Genie of Fairview Door Co. We’re the same family, employing the same knowledgeable people from our old locations. As always, you can rely on our quality products and expertise, whether you need a component for do-it-yourself repair or need to shop for a new garage door or opener.